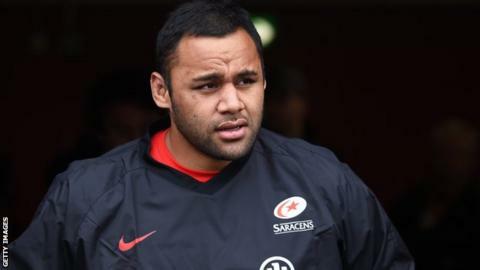 Saracens have warned Billy Vunipola about his behaviour and said he made a "serious error of judgment" defending Israel Folau's social media post claiming "hell awaits" gay people. England forward Vunipola liked the post by Folau and called for people to "live their lives how God intended". He has issued a statement saying he had not intended to "cause suffering". "The player has been formally warned about his future conduct," said Saracens in a statement. "At Saracens, we are one family, open to all, with the firm view that everyone should be treated equally with respect and humility. Vunipola's statement, released at the same time, said: "I can see that my recent post has hurt people. My intention was never to cause suffering. "My intention was to express my belief in the word of God. These beliefs are a source of great strength, comfort and guidance in my life. Folau's contract was terminated by Rugby Australia on Monday because of a 'high-level breach' of his code of conduct. He had posted a photo on Instagram earlier, with the message: "Warning. Drunks, homosexuals, adulterers, liars, fornicators, thieves, atheists, idolators. Hell awaits you. Repent! Only Jesus saves." Vunipola - who was booed during Saturday's Premiership defeat by Bristol - was criticised for liking Folau's post and the Rugby Football Union has said it intends to hold a meeting with the player this week.